I actually had time to sit and do some art today, finally! 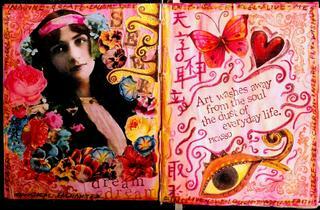 I did two pages in an art journal book. Felt wonderful to accomplish that, can't wait to experiment with more pages tommorrow! Met Pete Rose last night down at the strip, took some pictures and got his autograph. The kids had no clue who he was.